Council Directive 78/933/EEC of 17 October 1978 on the approximation of the laws of the Member States relating to the installation of lighting and light-signalling devices on wheeled agricultural or forestry tractors (3) has been substantially amended several times (4). In the interests of clarity and rationality the said Directive should be codified. Directive 78/933/EEC is one of the separate Directives of the EC type-approval system provided for in Council Directive 74/150/EEC as replaced by Directive 2003/37/EC of the European Parliament and of the Council of 26 May 2003 on type-approval of agricultural or forestry tractors, their trailers and interchangeable towed machinery, together with their systems, components and separate technical units (5), and lays down technical prescriptions concerning the design and construction of wheeled agricultural or forestry tractors as regards the installation of lighting and light-signalling devices. Those technical prescriptions concern the approximation of the laws of the Member States to enable the EC type-approval procedure provided for in Directive 2003/37/EC to be applied in respect of each type of tractor. Consequently, the provisions laid down in Directive 2003/37/EC relating to agricultural and forestry tractors, their trailers and interchangeable towed machinery, together with their systems, components and separate technical units, apply to this Directive. 1. ‘Tractor’ (agricultural or forestry) means any motor vehicle, fitted with wheels or endless tracks, having at least two axles, the main function of which lies in its tractive power and which is specially designed to tow, push, carry or power certain tools, machinery or trailers intended for agricultural or forestry use. It may be equipped to carry a load and passengers. 2. This Directive shall apply only to tractors defined in paragraph 1 which are equipped with pneumatic tyres and have a maximum design speed of between 6 and 40 km/h. 1. No Member State may refuse to grant EC type-approval or national type-approval of a type of tractor on grounds relating to the installation of lighting and light-signalling devices, whether mandatory or optional, listed in points 1.5.7 to 1.5.21 of Annex I if these are installed in accordance with the requirements set out in that Annex. may refuse to grant national type-approval. may refuse the registration, sale or entry into service of those new vehicles. No Member State may refuse the registration, or prohibit the sale, entry into service or use of tractors on grounds relating to the installation of lighting and light-signalling devices, whether mandatory or optional, listed in points 1.5.7 to 1.5.21 of Annex I if these are installed in accordance with the requirements set out in that Annex. A Member State which has granted EC type-approval shall take the necessary measures to ensure that it is informed of any modification to any of the parts or characteristics referred to in point 1.1 of Annex I. The competent authorities of that Member State shall determine whether further tests should be carried out on the modified tractor type and a fresh report drawn up. Where such tests reveal failure to comply with the requirements of this Directive, the modification shall not be approved. Any amendments necessary to adapt to technical progress the requirements of Annexes I and II shall be adopted in accordance with the procedure referred to in Article 20(3) of Directive 2003/37/EC. Directive 78/933/EEC, as amended by the Directives listed in Annex III, Part A, is repealed, without prejudice to the obligations of the Member States relating to the time-limits for transposition into national law and application of the Directives set out in Annex III, Part B. This Directive shall enter into force on the 20th day following that of its publication in the Official Journal of the European Union. It shall apply from 1 January 2010. Done at Brussels, 13 July 2009. (1) OJ C 175, 27.7.2007, p. 40. (2) Opinion of the European Parliament of 19 February 2008 (not yet published in the Official Journal) and Council decision of 22 June 2009. (3) OJ L 325, 20.11.1978, p. 16. (5) OJ L 171, 9.7.2003, p. 1.
the number and positioning of the devices. The following are likewise considered not to be tractors of a different type: tractors which differ within the meaning of points 1.1.1 and 1.1.2 above, but not in such a way as to entail a change in the type, number, positioning and geometric visibility of the lamps prescribed for the tractor type in question, and tractors on which optional lamps are fitted or are absent. ‘Transverse plane’ means a vertical plane perpendicular to the median longitudinal plane of the tractor. ‘Unladen tractor’ means the tractor in running order, as defined in point 2.1.1 of Annex I, model information document, to Directive 2003/37/EC. ‘Laden tractor’ means the tractor loaded to its technically permissible maximum weight, as stated by the manufacturer, who shall also fix the distribution of this weight between the axles. ‘Lamp’ means a device designed to illuminate the road (headlamp) or to emit a light signal. Rear registration-plate lamps and reflex reflectors shall likewise be regarded as lamps. ‘Equivalent lamps’ means lamps having the same function and authorised in the country in which the tractor is registered; such lamps may have different characteristics from those installed on the tractor when it is approved, on condition that they satisfy the requirements of this Annex. ‘Independent lamps’ means lamps having separate lenses, separate light sources, and separate lamp bodies. ‘Grouped lamps’ means devices having separate lenses and separate light sources, but a common lamp body. ‘Combined lamps’ means devices having separate lenses but a common light source and a common lamp body. ‘Reciprocally incorporated lamps’ means devices having separate light sources (or a single light source operating under different conditions), totally or partially common lenses and a common lamp body. ‘Concealable illuminating lamp’ means a headlamp capable of being partly or completely hidden when not in use. This result may be achieved by means of a movable cover, by displacement of the headlamp or by any other suitable means. The term ‘retractable’ is used more particularly to describe a concealable lamp the displacement of which enables it to be inserted within the bodywork. ‘Variable position lamps’ means lamps installed on the tractor which can move in relation to it and whose lenses cannot be concealed. ‘Main-beam headlamp’ means the lamp used to illuminate the road over a long distance ahead of the tractor. ‘Dipped-beam headlamp’ means the lamp used to illuminate the road ahead of the tractor without causing undue dazzle or discomfort to oncoming drivers and other road-users. ‘Front fog-lamp’ means the lamp used to improve the illumination of the road in case of fog, snowfall, rainstorms or dust clouds. ‘Reversing lamp’ means the lamp used to illuminate the road to the rear of the tractor and to warn other road-users that the tractor is reversing or about to reverse. ‘Direction-indicator lamp’ means the lamp used to indicate to other road-users that the driver intends to change direction to the right or to the left. ‘Hazard-warning signal’ means the device permitting the simultaneous operation of all of a tractor’s direction indicator lamps to draw attention to the fact that the tractor temporarily constitutes a special danger to other road-users. ‘Stop lamp’ means the lamp used to indicate to other road-users to the rear of the tractor that the latter’s driver is applying the service brake. ‘Rear registration-plate lamp’ means the device used to illuminate the space intended to accommodate the rear registration plate; it may consist of different optical elements. ‘Front position (side) lamp’ means the lamp used to indicate the presence and the width of the tractor when the latter is viewed from the front. ‘Rear position (side) lamp’ means the lamp used to indicate the presence and the width of the tractor when the latter is viewed from the rear. ‘Rear fog-lamp’ means the lamp used to render the tractor more readily visible from the rear in dense fog. ‘Parking lamp’ means the lamp used to draw attention to the presence of a stationary tractor, without a trailer, in a built-up area. In such circumstances it replaces the front and rear position (side) lamps. ‘End-outline marker lamp’ means the lamps fitted to the extreme outer edge as close as possible to the top of the tractor and intended clearly to indicate the tractor’s overall width. This signal is intended, for certain tractors, to complement the tractor’s front and rear position (side) lamps by drawing particular attention to its bulk. ‘Reflex reflector’ means a device used to indicate the presence of a tractor by the reflection of light emanating from a light source not connected to the tractor, the observer being situated near the source. other plates and retro-reflecting signals which must be used to comply with a Member State’s specifications for use as regards certain categories of vehicles or certain methods of operation. ‘Work lamp’ means a device for illuminating a working area or process. ‘Illuminating surface of a lighting device’ (points 1.5.7 to 1.5.10) means the orthogonal projection of the full aperture of the reflector in a transverse plane. If the lamp glass (or glasses) extend(s) over part only of the full aperture of the reflector, then the projection of that part only is taken into account. In the case of a dipped-beam headlamp, the illuminating surface is limited on the side of the cut-off by the apparent projection of the line of the cut-off on to the lens. If the reflector and glass are adjustable, the mean adjustment should be used. ‘Illuminating surface of a signalling lamp other than a reflex reflector’ (points 1.5.11 to 1.5.19) means the orthogonal projection of the lamp in a plane perpendicular to its axis of reference and in contact with the exterior light-emitting surface of the lamp, this projection being bounded by the edges of screens situated in this plane, each allowing only 98 % of the total luminous intensity of the light to persist in the direction of the axis of reference. To determine the lower, upper and lateral limits of the illuminating surface, only screens with horizontal or vertical edges shall be used. ‘Illuminating surface of a reflex reflector’ (point 1.5.20) means the orthogonal projection of the reflecting surface of the reflex reflector in a plane perpendicular to its axis of reference and bounded by planes touching the outer edges of the light projection surface of the reflex reflector and parallel to this axis. To determine the lower, upper and lateral limits of the illuminating surface, only vertical and horizontal planes shall be used. 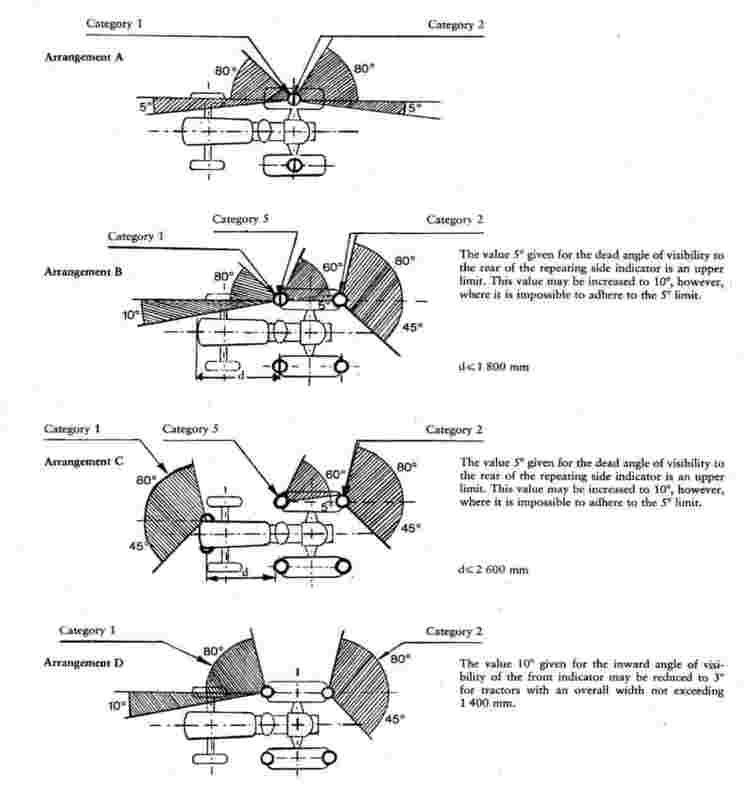 ‘Exterior light-emitting surfaces’, for a defined direction of observation, means the orthogonal projection of the surface of light emission in a plane perpendicular to the direction of observation (see drawing in Appendix 1). ‘Axis of reference’ means the characteristic axis of the light signal determined by the manufacturer of the lamp for use as the direction of reference (H = 0°, V = 0°) for photometric measurements and when fitting the lamp on the tractor. ‘Centre of reference’ means the intersection of the axis of reference with the exterior light-emitting surface, specified by the manufacturer of the lamp. ‘Angles of geometric visibility’ means the angles which determine the field of the minimum solid angle in which the exterior light-emitting surface of the lamp must be visible. That field of the solid angle is determined by the segments of a sphere of which the centre coincides with the centre of reference of the lamp and the equator is parallel with the ground. These segments are determined in relation to the axis of reference. The horizontal angles β correspond to the longitude and the vertical angles α to the latitude. There must be no obstacle on the inside of the angles of geometric visibility to the propagation of light from any part of the exterior light-emitting surface of the lamp. This shall not apply to any obstacles existing at the time when the lamp is approved if approval is required. of customs seals affixed to the tractor and devices for securing and protecting such seals. ‘Overall width’ means the distance between the two vertical planes defined in point 1.10 above. ‘A single lamp’ means any combination of two or more lamps, whether identical or not, having the same function and colour, if it comprises devices, the projection of whose aggregate light-emitting surfaces in a given transverse plane occupies 60 % or more of the area of the smallest rectangle circumscribing the projections of the light-emitting surfaces of the aforementioned lamps, provided that such combination is, where approval is required, approved as a single lamp. This possible combination does not apply to main-beam headlamps, dipped-beam headlamps and front fog lamps. ‘Two lamps’ or ‘an even number of lamps’ means a single light-emitting surface in the shape of a band, if placed symmetrically in relation to the median longitudinal plane of the tractor and extending on both sides to within not less than 400 mm of the extreme outer edge of the tractor, and being not less than 800 mm long. The illumination of such a surface shall be provided by not less than two light sources placed as close as possible to its ends. The light-emitting surface may be constituted by a number of juxtaposed elements on condition that the projections of the several individual light-emitting surfaces in the same transverse plane occupy not less than 60 % of the area of the smallest rectangle circumscribing the projections of those individual light-emitting surfaces. ‘Distance between two lamps’ which face in the same direction, means the distance between the orthogonal projections in a plane perpendicular to the direction in question of the outlines of the two illuminating surfaces as defined according to the case mentioned in point 1.6. ‘Optional lamp’ means a lamp the presence of which is left to the discretion of the manufacturer. ‘Operational tell-tale’ means a tell-tale showing whether a device that has been actuated is operating correctly or not. ‘Circuit-closed tell-tale’ means a tell-tale showing that a device has been switched on but not showing whether it is operating correctly or not. The application for EC approval of a tractor type with regard to the installation of its lighting and light-signalling devices shall be submitted by the tractor manufacturer or his representative. layout drawing(s) for each individual lamp showing the illuminating surfaces as defined in point 1.6. An unladen tractor fitted with lighting and light-signalling equipment as described in point 2.2.2 and representative of the tractor type to be approved, must be submitted to the technical authority conducting approval tests. The document provided for in Annex II shall be attached to the type-approval document. 3.1. The lighting and light-signalling devices must be so fitted that under normal conditions of use, and notwithstanding any vibration to which they may be subjected, they retain the characteristics laid down in this Annex and enable the tractor to comply with the requirements of this Annex. In particular, it shall not be possible for the adjustment of the lamps to be inadvertently disturbed. Tractors must be equipped with electrical connectors to enable a detachable light-signalling system to be used. In particular tractors must be fitted with the permanently connected socket outlet recommended in standard ISO R 1724 (Electrical connections for vehicles with 6 or 12 volt electrical systems applying more specifically to private motor cars and lightweight trailers or caravans) (first edition, April 1970) or ISO R 1185 (Electrical connections between towing and towed vehicles having 24 volt electrical systems used for international commercial transport purposes) (first edition, March 1970). In the case of standard ISO R 1185, the function of contact 2 shall be restricted to the rear position (side) lamp and to the end-outline marker lamp on the left-hand side. 3.2. The illuminating lamps described in points 1.5.7, 1.5.8 and 1.5.9 must be so fitted that a correct setting of their alignment can easily be performed. 3.3. For all light-signalling devices, the reference axis of the lamp when fitted to the tractor must be parallel with the bearing plane of the tractor on the road and with the longitudinal plane of the tractor. In each direction a tolerance of ± 3° shall be allowed. In addition, any specific instructions as regards fitting laid down by the manufacturer must be complied with. 3.4. In the absence of specific instructions, the height and alignment of the lamps shall be checked with the unladen tractor placed on a flat, horizontal surface. have substantially identical photometric characteristics. 3.6. On tractors whose external shape is asymmetrical, the requirements of points 3.5.1 and 3.5.2 shall be satisfied as far as possible. These requirements shall be regarded as having been met if the distance of the two lamps from the median longitudinal plane and from the bearing plane on the ground is the same. 3.7. Lamps having different functions may be independent or be grouped, combined or reciprocally incorporated in one device, provided that each such lamp complies with the requirements applicable to it. 3.8. The maximum height above ground shall be measured from the highest point and the minimum height from the lowest point of the illuminating surface. 3.9. In the absence of specific requirements no lamps other than direction indicator lamps and the hazard warning signal may emit a flashing light. 3.10. No red light shall be visible towards the front and no white light other than that from the reversing lamp or work lamps shall be visible towards the rear. for the visibility of a white light towards the rear: there is no direct visibility of a white light if viewed by an observer moving within zone 2 in a transverse plane situated 25 m behind the tractor (see Appendix 2, Figure 2). as regards width, by two vertical planes which make an angle of 15° towards the front and rear respectively, and towards the outside by reference to the median plane of the tractor, passing through the point (or points) of contact of vertical planes which are parallel with the median longitudinal plane of the tractor, and limiting the overall width of the tractor when on wide track. If there are several points of contact, the one furthest towards the front shall be selected for zone 1 and the one furthest towards the rear shall be selected for zone 2. 3.11. The electrical connections must be such that the front and rear position (side) lamps, the end-outline marker lamps if they exist, and the rear registration-plate lamp can only be switched on and off simultaneously. 3.12. The electrical connections must be such that the main-beam and dipped-beam headlamps, and the front and rear fog lamps cannot be switched on unless the lamps referred to in point 3.11 are also switched on. This requirement shall not apply, however, to main-beam or dipped-beam headlamps when their luminous warnings consist of the intermittent lighting up at short intervals of the dipped-beam headlamps or the intermittent lighting up of the main-beam headlamps or the alternate lighting up at short intervals of the dipped-beam and main-beam headlamps. rear reflex reflector, non-triangular: red. 3.14. The function of the circuit-closed tell-tales may be fulfilled by operational tell-tales. The concealment of lamps shall be prohibited, with the exception of main-beam headlamps, dipped-beam headlamps and front fog-lamps, which may be concealed when not in use. An illuminating device in the position of use shall remain in that position if the malfunction referred to in point 3.15.2.1 occurs alone or in conjunction with one of the malfunctions described in point 3.15.2.2. The absence of power for manipulating the lamp. A break, impedance, or short-circuit to earth in the electrical circuit, defects in the hydraulic or pneumatic leads, Bowden cables, solenoids or other components controlling or transmitting the energy intended to activate the concealment device. In the event of a defect in the concealment control, a concealed lighting device shall be capable of being moved into the position of use without the aid of tools. It must be possible to move illuminating devices into the position of use and to switch them on by means of a single control, without excluding the possibility of moving them into the position of use without switching them on. However, in the case of grouped-main-beam and dipped-beam headlamps, the control referred to above is required only to activate the dipped-beam headlamps. It must not be possible deliberately, from the driver’s seat, to stop the movement of switched-on headlamps before they reach the position of use. If there is a danger of dazzling other road users by the movement of headlamps, they may light up only when they have reached their final position. At temperatures of – 30 to + 50 °C an illuminating device must be capable of reaching the fully-open position within three seconds of initial operation of the control. these lamps may be locked in the position required by traffic conditions. Locking must be automatic. The outer edges of the illuminating surface must in no case be closer to the extreme outer edge of the tractor than the outer edges of the illuminating surface of the dipped-beam headlamps. As near to the front of the tractor as possible; however, the light emitted must not in any circumstances cause discomfort to the driver either directly, or indirectly through the rearview mirrors and/or other reflecting surfaces of the tractor. The visibility of the illuminating surface, including its visibility in areas which do not appear to be illuminated in the direction of observation considered, must be ensured within a divergent space defined by generating lines based on the perimeter of the illuminating surface and forming an angle of not less than 5° with the axis of reference of the headlamp. Apart from the devices necessary to maintain correct adjustment, and when there are two pairs of main-beam headlamps, one pair consisting of headlamps functioning as main-beam only, may swivel, according to the angle of lock of the steering, about an axis very near the vertical. with the dipped-beam headlamp and the other front lamps. The main-beam headlamps may be switched on either simultaneously or in pairs. For changing over from the dipped to the main beam at least one pair of main beams must be switched on. For changing over from the main to the dipped beam all main-beam headlamps must be switched off simultaneously. The dipped beams may remain switched on at the same time as the main beams. The aggregate maximum intensity of the main beams which can be switched on simultaneously must not exceed 225 000 cd. This maximum intensity shall be obtained by adding together the individual maximum intensities measured at the time of component type-approval and shown on the relevant approval certificates. in the case of tractors equipped for the fitting of portable devices at the front, two dipped-beam headlamps in addition to the lamps mentioned in point 4.2.4.2.1 shall be allowed at a height not exceeding 3 000 mm, if the electrical connections are such that two pairs of dipped-beam headlamps cannot be switched on at the same time. As near to the front of the tractor as possible; however, the light emitted must not in any circumstances cause discomfort to the driver either directly or indirectly through the rearview mirrors and/or other reflecting surfaces of the tractor. 45° outwards and 5° inwards. Within this field, almost the whole of the light-emitting surface of the light must be visible. The presence of panels or other items of equipment near the lamp must not give rise to secondary effects causing discomfort to other road users. The alignment of the dipped-beam headlamps must not vary according to the angle of lock of the steering. If the height of the dipped-beam headlamps is greater than 1 200 but not greater than 1 500 mm, the limit of 4 % laid down in point 4.2.6.2 shall be increased to 6 %; the dipped-beam headlamps referred to in point 4.2.4.2.2 must be aligned in such a way that, measured at 15 m from the lamp, the horizontal line separating the lit zone from the unlit zone is situated at a height equivalent to only half the distance between the ground and the centre of the lamp. with the main-beam headlamp and the other front lamps. with the other front lamps. The control for changing over to the dipped beam must switch off all main-beam headlamps simultaneously. The requirements of point 3.5.2 shall not apply to dipped beam headlamps. Not less than 250 mm above the ground. No point on the illuminating surface must be higher than the highest point on the illuminating surface of the dipped-beam headlamp. The alignment of the front fog-lamps must not vary according to the angle of lock of the steering. They must be directed forwards without causing undue dazzle or discomfort to oncoming drivers and other road users. It must be possible to switch the fog-lamp on and off independently of the main-beam or dipped-beam headlamps and vice versa. Not less than 250 mm and not more than 1 200 mm above the ground. At the back of the tractor. 45° outwards and 30° inwards if there are two. with any other rear lamp. It can only light up if the reverse gear is engaged and if the device which controls the starting or stopping of the engine is in such a position that operation of the engine is possible. It must not light up or remain lit up if either of the above conditions is not satisfied. Mandatory. Types of indicators fall into categories (1, 2 and 5) the assembly of which on one tractor constitutes an arrangement (A to D). Arrangement A shall be allowed only on tractors whose overall length does not exceed 4,60 m and in the case of which the distance between the outer edges of the illuminating surfaces is not more than 1,60 m.
Arrangements B, C and D shall apply to all tractors. The number of devices shall be such that they can emit signals which correspond to one of the arrangements referred to in point 4.5.3. 4.5.3. Arrangement (see Appendix 3). Two rear direction indicator lamps (category 2). These lamps may be independent, grouped or combined. The front and repeating side lamps may be independent, grouped, or combined. Two repeating side indicator lamps (category 5). Two rear direction-indicator lamps (category 2). The edge of the illuminating surface furthest from the median longitudinal plane of the tractor must not be more than 400 mm from the extreme outer edge of the tractor. The distance between the inner edges of the two illuminating surfaces shall be not less than 500 mm. Where the vertical distance between the rear direction-indicator lamp and the corresponding rear position (side) lamp is not more than 300 mm, the distance between the extreme outer edge of the tractor and the outer edge of the rear direction-indicator lamp must not exceed by more than 50 mm the distance between the extreme outer edge of the tractor and the outer edge of the corresponding rear position (side) lamp. For front direction-indicator lamps the illuminating surface must be not less than 40 mm from the illuminating surface of the dipped-beam headlamps or front fog-lamps, if any. A smaller distance is permitted if the luminous intensity in the reference axis of the direction-indicator lamp is equal to at least 400 cd. not more than 1 900 mm for all categories. If the structure of the tractor makes it impossible to keep to this maximum figure, the highest point on the illuminating surface may be at 2 300 mm for direction-indicator lamps in category 5, for those in categories 1 and 2 of arrangement A, for those in categories 1 and 2 of arrangement B and for those in categories 1 and 2 of arrangement D; it may be at 2 100 mm for those in categories 1 and 2 of the other arrangements. up to 4 000 mm for optional direction-indicator lamps. The distance between the centre of reference of the illuminating surface of the side direction-indicator lamp (arrangements B and C) and the transverse plane which marks the forward boundary of the tractor’s overall length shall not exceed 1 800 mm. If the structure of the tractor makes it impossible to comply with the minimum angles of visibility, this distance may be increased to 2 600 mm. 15° above and below the horizontal. The vertical angle below the horizontal may be reduced to 10° in the case of side repeating direction-indicator lamps of arrangements B and C if their height is less than 1 500 mm. The same applies in the case of direction indicator lamps in category 1 of arrangements B and D.
If individual specifications for installation are laid down by the manufacturer they must be observed. with one or more lamps, which may not be concealed. with another lamp, save in accordance with the arrangements referred to in point 4.5.3.
with a parking lamp only, but solely in the case of direction-indicator lamps in category 5. Direction-indicator lamps shall switch on independently of the other lamps. All direction-indicator lamps on one side of a tractor shall be switched on and off by means of one control and must flash in phase. Mandatory for all direction indicator lamps not directly visible to the driver. It may be optical or auditory or both. If it is optical, it shall be a flashing light which, in the event of the malfunction of any of the direction indicator lamps other than the repeating side direction-indicator lamps, is either extinguished, or remains alight without flashing, or shows a marked change of frequency. If it is entirely auditory, it shall be clearly audible and shall show a marked change of frequency in the event of any malfunction. If a tractor is equipped to draw a trailer, it must be equipped with a special optical operational tell-tale for the direction-indicator lamps on the trailer unless the tell-tale of the drawing vehicle allows the failure of any one of the direction-indicator lamps on the tractor combination thus formed to be detected. The light shall be a flashing light flashing 90 ± 30 times per minute. Operation of the light-signal control shall be followed within not more than one second by the appearance of the light and within not more than one and one-half seconds by its first extinction. If a tractor is authorised to draw a trailer, the control of the direction-indicator lamps on the tractor shall also operate the indicator lamps of the trailer. In the event of failure, other than a short-circuit, of one direction-indicator lamp, the others must continue to flash but the frequency under this condition may be different from that specified. As specified in the corresponding headings of point 4.5. The signal shall be operated by means of a separate control enabling all the direction-indicator lamps to function in phase. Mandatory. Flashing warning light, which can operate in conjunction with the tell-tale(s) specified in point 4.5.11. As specified in point 4.5.12. If a tractor is equipped to draw a trailer the hazard-warning signal control must be also capable of bringing the direction-indicator lamps on the trailer into action. The hazard-warning signal must be able to function even if the device which starts or stops the engine is in a position which makes it impossible to start the engine. Not less than 500 mm apart. This distance may be reduced to 400 mm if the overall width of the vehicle is less than 1 400 mm. Above the ground: not less than 400 mm, not more than 1 900 mm or 2 300 mm if the shape of the bodywork makes it impossible to keep to 1 900 mm. 15° above and below the horizontal. The vertical angle below the horizontal may be reduced to 10° in the case of lamps less than 1 500 mm above the ground; to 5° in the case of lamps less than 750 mm above the ground. Towards the rear of the tractor. with one or more other rear lamps. with the rear position (side) lamp or the parking lamp. must light up when the service brake is applied. Optional. If it exists, it should be a non-flashing warning light which comes on in the event of the malfunctioning of the stop lamps. The luminous intensity of the stop lamps must be markedly greater than that of the rear position (side) lamps. Such that the device is capable of illuminating the space for the registration plate. with one or more rear lamps. with the rear position (side) lamps. The device must light up only at the same time as the rear position (side) lamps. Optional. If it exists, its function should be performed by the tell-tale required for the front and rear position (side) lamps. Two or four (see point 4.2.4.2.2). The point on the illuminating surface which is farthest from the tractor's median longitudinal plane must not be more than 400 mm from the extreme outer edge of the tractor. The clearance between the respective inner edges of the two illuminating surfaces must not be less than 500 mm. Above the ground: not less than 400 mm, not more than 1 900 mm or not more than 2 300 mm if the shape of the bodywork makes it impossible to keep within the 1 900 mm prescribed above. No specifications provided that the lamps are aligned forwards and the angles of geometrical visibility specified in point 4.9.5 are complied with. For the two front position (side) lamps: 10° inwards and 80° outwards. However, the angle of 10° inward may be reduced to 5° if the shape of the bodywork makes it impossible to keep to 10°. For tractors with an overall width not exceeding 1 400 mm this angle may be reduced to 3° if the shape of the bodywork makes it impossible to keep to 10°. 15° above and below the horizontal. The vertical angle below the horizontal may be reduced to 10° if the height of the lamp above the ground is less than 1 500 mm, and to 5° if this height is less than 750 mm. with any other front lamp. Mandatory. This tell-tale shall be non-flashing. It shall not be required if the instrument panel lighting can only be turned on simultaneously with the front position (side) lamps. The distance between the inner edges of the two illuminating surfaces shall be not less than 500 mm. This distance may be reduced to 400 mm where the overall width of the tractor is less than 1 400 mm. 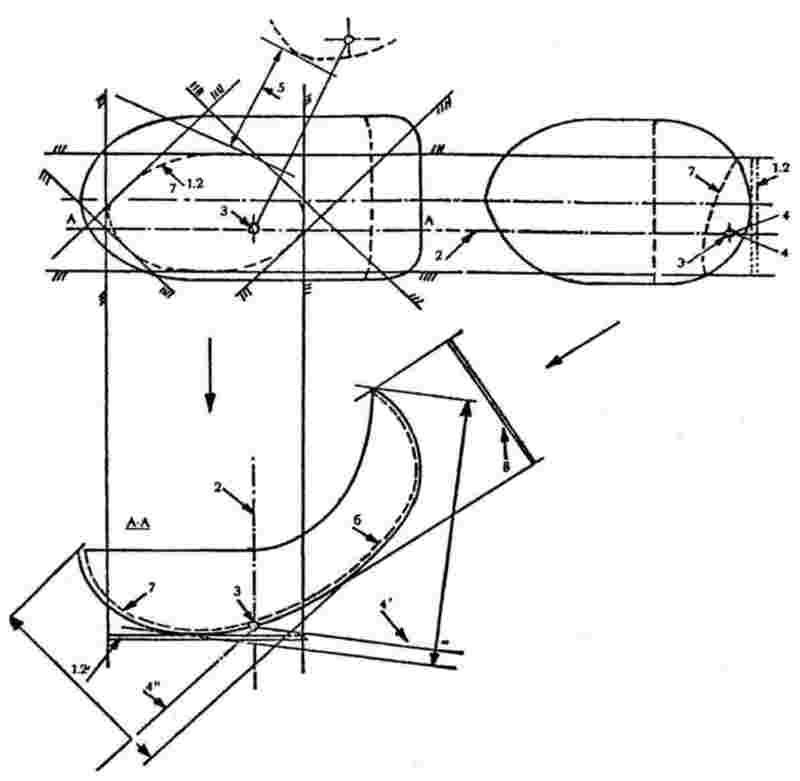 Above the ground: not less than 400 mm, not more than 1 900 mm, or not more than 2 300 mm if the shape of the bodywork makes it impossible to keep within 1 900 mm. or 80° inwards and 45° outwards. 15° above and below the horizontal. The angle below the horizontal may be reduced to 10° if the height of the lamp above the ground is less than 1 500 mm, and to 5° if this height is less than 750 mm. with the rear registration-plate lamp. with the stop lamp, the rear fog-lamp or the parking lamp. Mandatory. It must be combined with that of the front position (side) lamps. This must satisfy the conditions of geometric visibility. If there is only one rear fog lamp, it must be on the opposite side of the median longitudinal plane of the tractor to the direction of traffic prescribed in the country of registration. In all cases the distance between the rear fog-lamp and the stop lamp must be greater than 100 mm. Above the ground: not less than 400 mm, not more than 1 900 mm, or not more than 2 100 mm if the shape of the bodywork makes it impossible to keep within 1 900 mm. 5° above and below the horizontal. with any other rear lamps. with rear position (side) lamps or the parking lamp. Must be such that the rear fog lamp can light up only when the dipped-beam headlamps or the front fog-lamps are in use. If there are front fog-lamps, it must be possible to extinguish the rear fog-lamp independently of the front fog-lamps. Mandatory. An independent, fixed-intensity warning light. or one lamp on each side. The point on the illuminating surface which is farthest from the median longitudinal plane of the tractor must not be more than 400 mm from the extreme outer edge of the tractor. Furthermore, in the case of a pair of lamps, the lamps must be on the sides of the tractor. Above the ground: not less than 400 mm, not more than 1 900 mm or not more than 2 100 mm if the shape of the bodywork makes it impossible to keep within 1 900 mm. 45° outwards, towards, the front and towards the rear. 15° above and below the horizontal. The vertical angle below the horizontal may be reduced to 10° if the height of the lamp above the ground is less than 1 500 mm; and to 5° if this height is less than 750 mm. Such that the lamps meet the conditions concerning visibility towards the front and towards the rear. at the rear: with the position (side) lamps, the stop lamps and the rear fog-lamps. with the direction indicator lamps in category 5. The connections must allow the parking lamp(s) on the same side of the tractor to be lit independently of any other lamps. Optional. If there is one, it must not be possible to confuse it with the tell-tale for the position (side) lamps. The function of this lamp may also be performed by simultaneously switching on the front and rear position (side) lamps on the same side of the tractor. Optional on tractors exceeding 2,10 m in width. Prohibited on all other tractors. Two visible from the front and two visible from the rear. As close as possible to the extreme outer edge of the tractor. At the maximum height compatible with the requirements relating to the position as regards width and to the symmetry of the lamps. 5° above and 20° below the horizontal. Such that the lamps meet the visibility requirements towards the front and towards the rear. with other lamps, except for the case referred to in point 4.2.4.2.2. Subject to all the other conditions being met, the lamp visible from the front and the lamp visible from the rear, on the same side of the tractor, may be combined in one device. The position of an end-outline marker lamp in relation to the corresponding position (side) lamp shall be such that the distance between the projections on a transverse vertical plane of the points nearest to the illuminating surfaces of the two lamps considered is not less than 200 mm. Two or four (see point 4.14.5.2.). The point on the illuminating surface which is farthest from the tractor's median longitudinal plane must be not more than 400 mm from the extreme outer edge of the tractor. The distance between the interior edges of the reflex reflectors shall be 600 mm minimum. This distance may be reduced to 400 mm if the overall width of the tractor is less than 1 300 mm. Above the ground: not less than 400 mm and not more than 900 mm. The upper limit may be increased to 1 200 mm if it is not possible to keep within the height of 900 mm without having to use fixing devices liable to be easily damaged or bent. 15° above and below the horizontal. The vertical angle below the horizontal may be reduced to 5° if the height of the lamp is less than 750 mm. two reflex reflectors must keep within the maximum height of 900 mm above the ground, observe a distance between the interior edges of at least 400 mm and have a vertical angle of visibility above the horizontal of 15°. the other two shall keep within a maximum height of 2 300 mm above the ground and shall be bound by the requirements of points 4.14.4.1 and 4.14.5.1. The illuminating surface of the reflex reflector may have parts in common with that of any other rear lamp. This lamp must be illuminated independently of all other lamps in view of the fact that it does not illuminate the road or act as a signalling device on the road. Every series-produced tractor shall conform to the tractor type which received type approval as regards the installation of lighting and light-signalling devices and their characteristics as specified by this Directive. 15. The following document, bearing the type-approval mark indicated above, is annexed to this type-approval certificate: … list(s) of devices presented by the manufacturer for the lighting and light-signalling assembly; for each device the manufacturer's mark and the component type-approval mark are indicated. (1) Annex the layout drawing for the tractor, as mentioned in point 2.2.3 of Annex I to Directive [2009/61/EC] of the European Parliament and of the Council of 13 July 2009 relating to the installation of lighting and light-signalling devices on wheeled agricultural and forestry tractors. if the tractors in question meet the requirements of Directive 78/933/EEC, as amended by this Directive. prohibit the registration, sale or entry into service of such a vehicle.